The V&A is renowned for its world-famous collections of art and design, but perhaps you didn’t know that it also houses a substantial Theatre and Performance Collection. This fantastic collection contains everything from costumes, architectural plans and financial records to portraits, playbills and even puppets! From 1987 these collections were housed at the V&A’s Theatre Museum in Covent Garden, but unfortunately this was forced to close in 2007 due to a lack of funding. In 2009 the V&A Museum opened its dedicated Theatre and Performance Galleries, where many of the collection’s highlights are on permanent display. However, much of the material remains in storage. The good news is that all of this material can be accessed through the V&A’s Theatre and Performance Archives which are held on a separate site in Kensington Olympia. 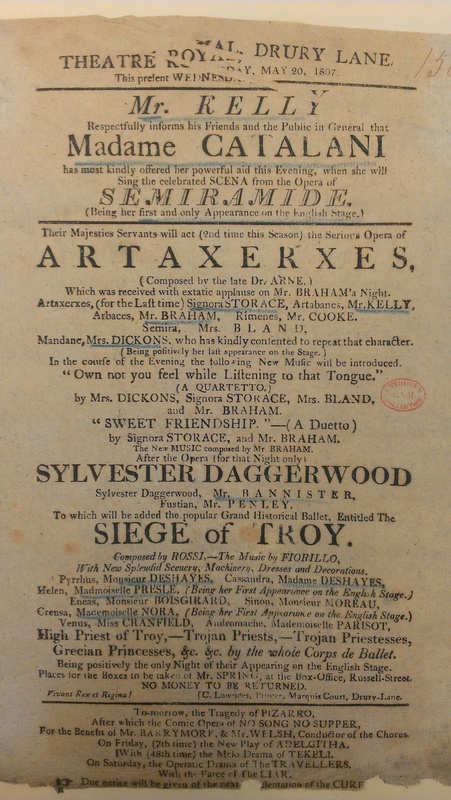 Over the summer I have been using these archives for my PhD research, and am pleased to report that they hold a great deal of material relating to opera. I will share a brief summary of my experiences, in the hope that it will be useful to others who wish to navigate this brilliant collection for operatic research. 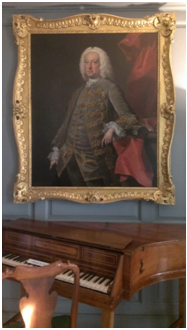 My current research concerns the British opera singer John Braham (c. 1774 – 1856), so I began my exploration of the V&A collections by searching for him in the collection database. This database only contains the part of the Theatre and Performance Collection that can be classified as objects and works of art – the V&A defines such items as “costumes, paintings, designs, ceramics and other museum objects.” A search for John Braham offers three pages of results (mainly portraits) with high quality images and further information on each item. My next step was to search the National Art Library Catalogue where archives, books, manuscripts and audio-visual items from the collection are listed. A search for John Braham produces various results, including playbills and sheet music. I also searched for the names of his productions, which produced further results; it is always a good idea to search around your main subject! The Theatre and Performance Collection contains many archives of institutions and individuals; they are all recorded in the National Art Library Catalogue, but the most important of these are also listed in greater detail here, so it is worth looking through this list too. My final step was to visit the Theatre and Performance Archive in Olympia. A conversation with a very helpful archivist had made me aware of the ‘Production Boxes’ held at the Archive. I was advised that for every theatre in London (and many major theatres in the provinces) the Archive holds a box for each year it was active. I wanted to find out which roles John Braham had performed at different points during his career; although I knew which dates he was working at certain theatres, I did not know which performances he had been in. 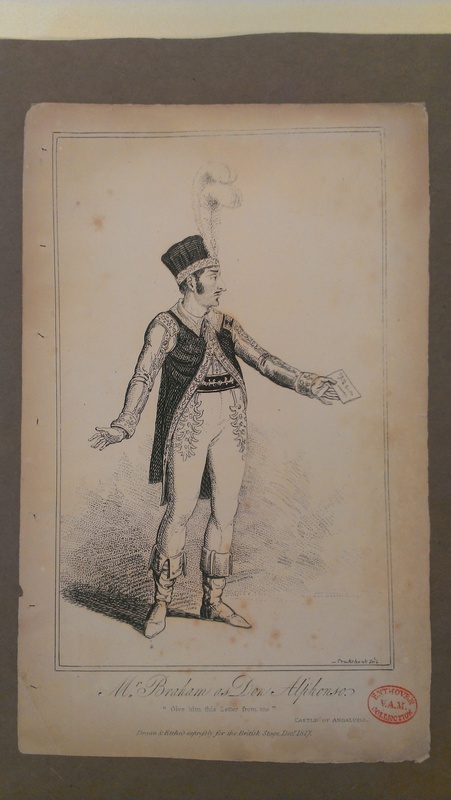 So I requested, for example, the box for ‘Theatre Royal 1811’. These huge boxes contain a seemingly random range of different materials relating to the productions in a given year. The boxes I looked at contained a huge number of playbills covering almost every single day of the year in some cases. These playbills always featured a cast list, so they allowed me to find out which roles John Braham had performed on given dates. 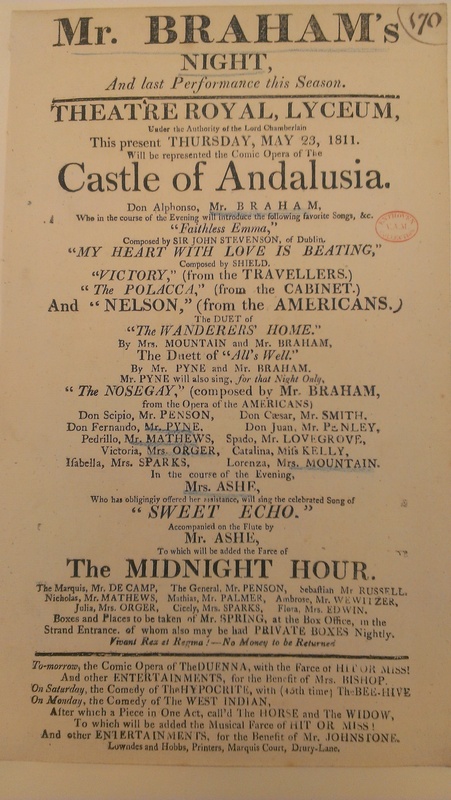 The playbills for some performances, such as the one above, list additional popular songs that Braham had chosen to perform in addition to the main performance. In some boxes I was also lucky enough to find items such as reviews, contemporary accounts of performances and even a few images. My research has only used a selection of the Theatre and Performance Collections; there is so much more material to explore. The V&A offer their own advice on Researching Theatre and Performance and also have a whole section of their website devoted to opera; this contains a range of useful articles and reading lists.